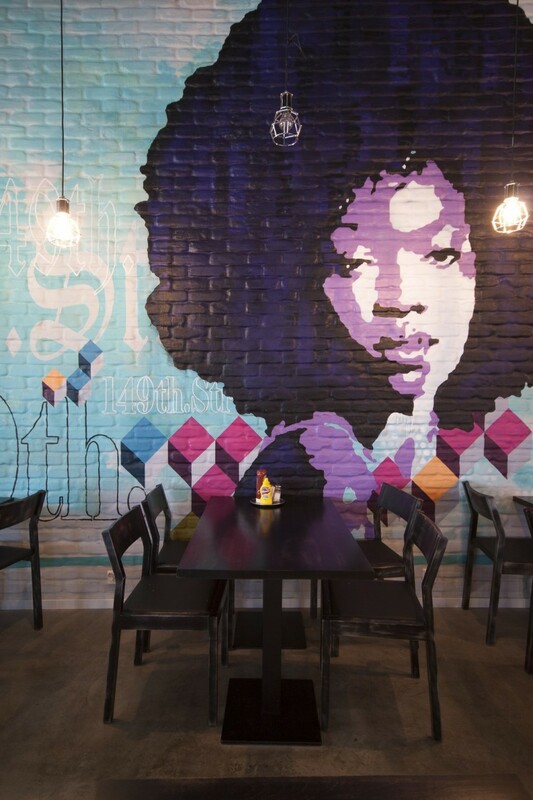 It is probably obvious what I loved about this space, the huge mural laid on painted bricks. I know it’s the trend now to use rustic and natural looking finishes, I had to share this post. I have some comments regarding the design of the entire space but overall I think the designer has some interesting elements.The old window frames, steel chairs, and bricks were beautifully integrated in the space and allowed the beautiful murals to stand out. This restauarant was designed by Amerikka Design Office. The Chico’s restaurant chain has been serving North American food to Finns since 1991. In spring 2012, the chain’s time-honored Iso Omena (‘Big Apple’) restaurant was reopened with a bold new interior. Amerikka Design Office Ltd. had created a new space concept for the restaurant, designed to support its new food, drink and service concept. Visually, the restaurant underwent a complete transformation. Diners and staff alike have felt at home in the restaurant: there has been positive feedback on its atmosphere, its spicy details and its solutions which make it easier to serve customers. The positivity is reflected in business figures, too. The visual standpoint for the restaurant’s look is modern-day USA, manifested through a wild mix of urban pulse and human warmth. The restaurant interior is marked by bold expression, beautifully fading surfaces, genuine materials and murals by painters Juha Lahtinen and Samuli Suonperä. The restaurant premises are designed to function seamlessly through all seasons and to serve a wide range of requirements. Chico’s invites customers to enjoy lunch, a drink or dinner on their own or with friends. To support the staff in their work, the restaurant facilities also comply with the chain’s service model. The change has been a success and a delight for customers and staff alike.